Joshua 3 records Israel’s crossing Jordan from the eastern side, to set up camp temporarily at Gilgal, and from there to take the city of Jericho. See our map in previous post.
. . . the water flowing downstream stood still, rising up in a mass that extended as far as Adam, a city next to Zarethan. The water flowing downstream into the Sea of the Arabah (the Dead Sea) was completely cut off, and the people crossed opposite Jericho. The priests carrying the ark of the LORD’s covenant stood firmly on dry ground in the middle of the Jordan, while all Israel crossed on dry ground until the entire nation had finished crossing the Jordan (Josh. 3:16-17, CSB). At spring flood, after the winter rains and during the barley harvest, the Jordan River could reach a width in excess of 100 feet and a depth of 10 feet. The priests as the leaders of the people were the first to step down into the water. Doing so was a risky activity with the river at flood stage. Carrying the ark could easily have caused them to be swept away by the current unless the promised miracle took place. Note that the people crossed “opposite Jericho.” Our photo below is at the Jordan at Qasr el-Yahud, opposite and a little south of Jericho. It would be somewhere near here that the crossing of Joshua 3 took place. Our photo looks to the north. 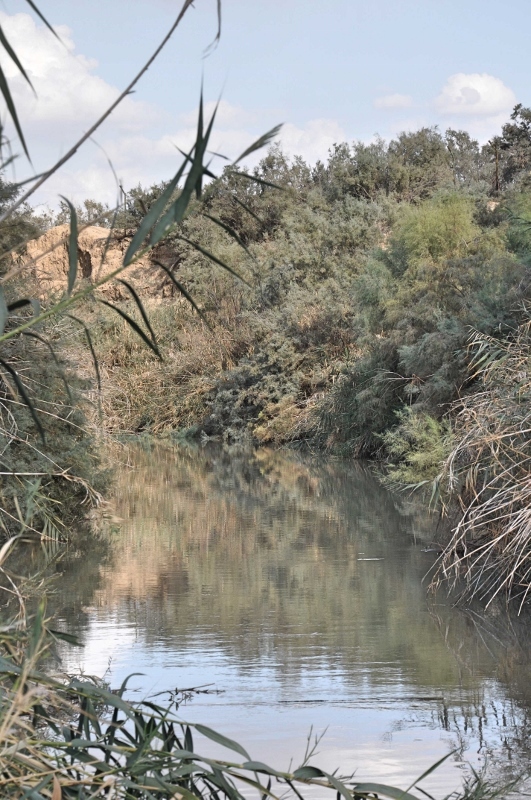 Jordan River at Qasr el-Yahud. Photo by Leon Mauldin. The Jordan River was at flood stage when God commanded Joshua to lead the people across. Just as when God opened the Red Sea, He provided a dry path through the Jordan when the priests, bearing the ark of the covenant, touched the edge of the river. . . Up until the 1950’s, more than 3 billion cubic feet flowed through the southern Jordan annually. with construction of a number of dams on the Jordan north of the Sea of Galilee and on rivers that feed the Jordan, that volume of water has been reduced to 300 million cubic feet a year (p.338). Qasr el-Yahud is a site on the Jordan thought by some to be across from the Bethany referenced in John 1:28, where John the Baptist did some of his baptizing. We had the opportunity to visit here in October. 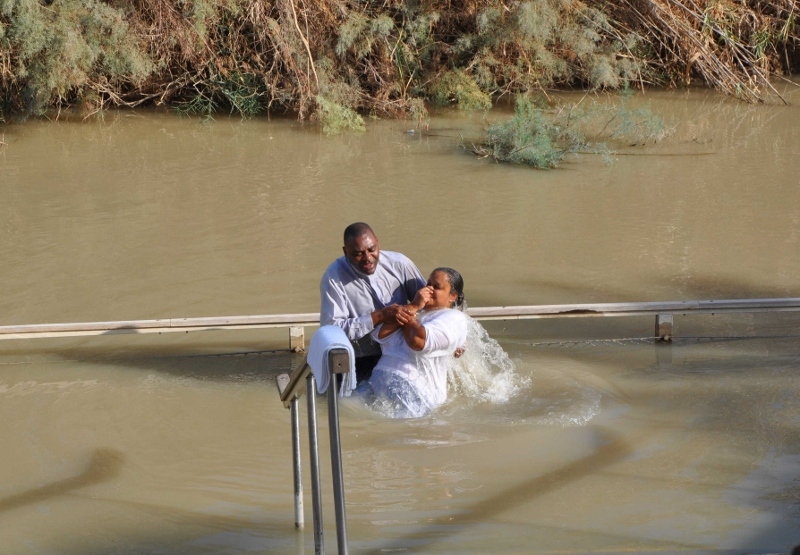 Baptism in the Jordan River. Photo by Leon Mauldin. This entry was posted on Monday, February 17th, 2014 at 7:31 PM and is filed under Bible History and Geography, Bible Study, Israel, Joshua, New Testament, Old Testament, photography, Travel, West Bank. You can follow any responses to this entry through the RSS 2.0 feed. You can leave a response, or trackback from your own site.